Trim fat from skirt steak, leaving a little for flavor. Place in baking dish and drizzle with 2 tablespoons Bertolli® Extra Virgin Olive Oil. Finely chop sage, thyme, rosemary and 2 cloves garlic. Add to steak and marinate 10 minutes. For polenta, heat 2 tablespoons Bertolli Extra Virgin Olive Oil and 2 to 3 cloves chopped garlic in skillet until golden brown. Add heavy cream and season with salt and freshly ground black pepper; let reduce. Add water. Add polenta, stirring as you add. As it thickens, whisk in Parmesan and cream cheese. Continue stirring 5 to 10 minutes until thick and creamy. Pour finished polenta on a platter or clean cutting board and top with additional Parmesan and drizzle with 2 tablespoons Bertolli Extra Virgin Olive Oil. Season steaks with salt and freshly ground black pepper and place in hot 12-inch skillet over high heat. Cook steak to desired doneness. 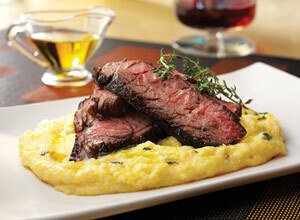 Plate steak and arrange polenta on edge of meat. Garnish with sprig of fresh rosemary or thyme and top with freshly ground black pepper.